Okay, when I am researching and writing, I go for a big picture of how a family lived, where they lived and what they did. I can’t do it on this post but we do have some answers! Yay! I have done a lot of research on my own but I also have this wonderful big book of answers that is a fabulous resource. It was written by Tommy Martinez (I guess at some point I should start calling him Tom, but I just think of him as Tommy) in 1989. 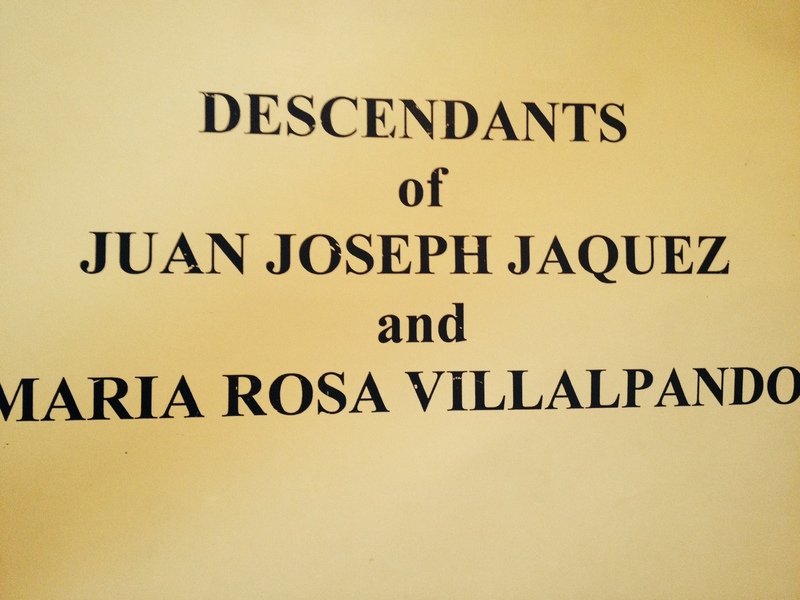 As you can see from the cover, it is the descendants of Juan Joseph Jaquez and Maria Rosa Villalpando. However, in this big book of wonderfulness there are over 2,600 names and it is a bit of a challenge just to comb the pages to figure out where we need to be and how the descendants are linked. Back to the question at hand, who is Sam Jaquez and how is he related to us? Therefore, we must start at the beginning. 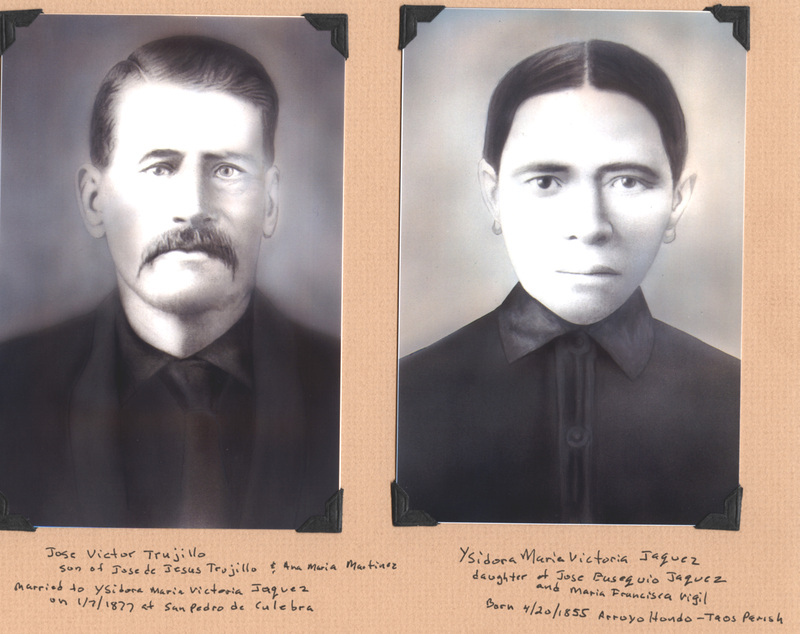 They married in 1817 in San Juan Pueblo, Rio Arriba. Felipe’s first wife, Maria Del Carmen Lujan died in 1836. The last child, Jose Julian Jaquez, only lived for one year and died in 1837. This is where our two families connect. 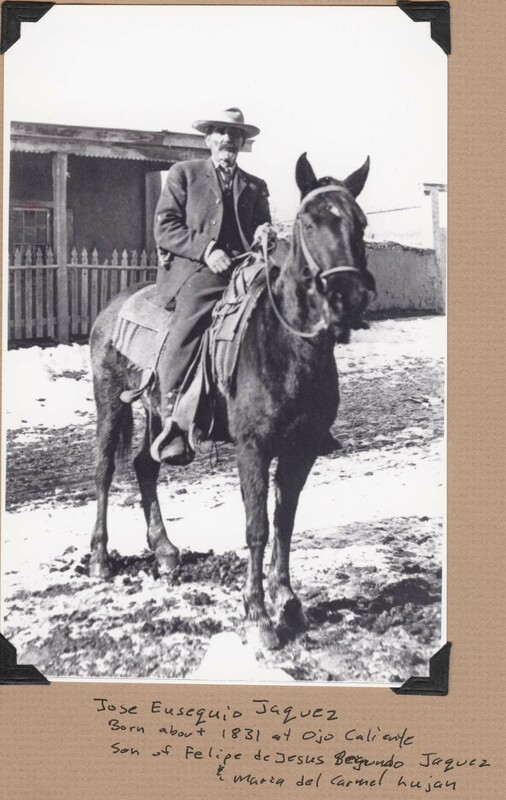 Jose Eusequio (guy on horse) had a half brother by the name of Jose Ynes Jaquez. Same father (Felipe), but different mothers. Then if we look at this half brother, Jose Ynes Jaquez, he married Maria de los Angeles Roybal in 1860. 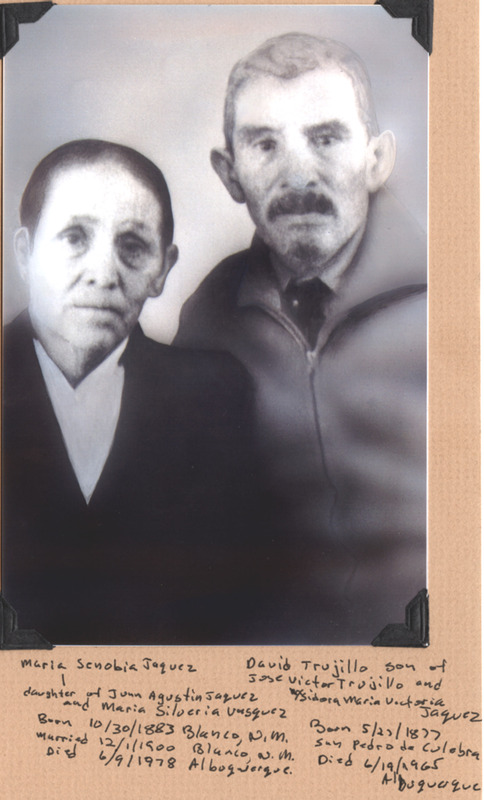 He marries Pablita Chavez and by 1910 they live in Blanco, NM. Now I show them living together until the 1920 census. By 1920, Pabilita has remarried and had additional children. She is now 45 years old, married to Manuel Montoya and has 5 year old Sostenes (Tina) Montoya, 3 year old Casimiro Montoya and 1 year old Filix Montoya. Her Jaquez children are also living with her and Manuel Montoya, including Joseph V Jaquez, age 20, Sam Jaquez, age 16, Frank Jaquez, age 14, and Mary Jaquez age 10. Samuel Jaquez married a woman by the name of Gregorita. Yay! We’ve arrived at Leroy and his wife Jane Jaquez. So, we (myself and my siblings) and Leroy Jaquez are 3rd cousins, 1 x removed. 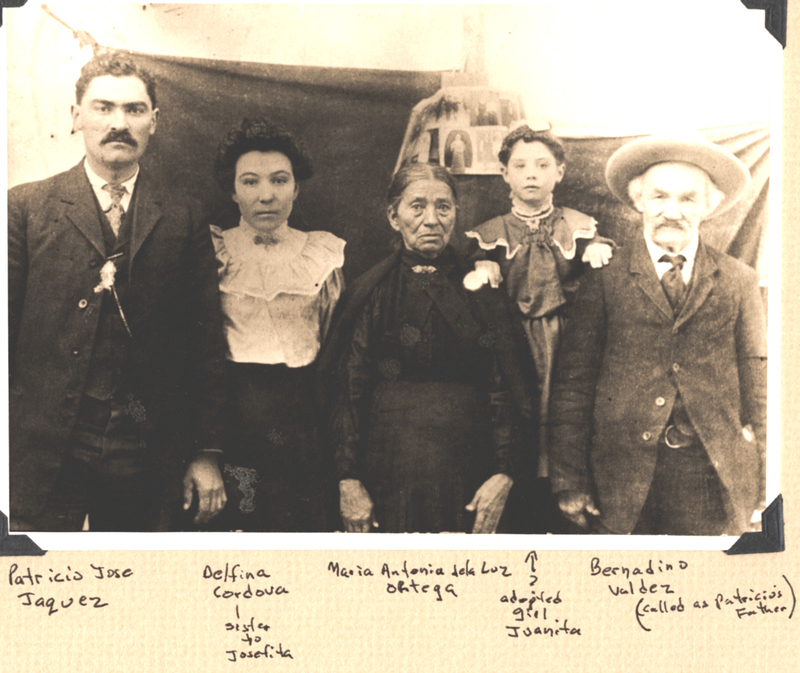 This family looks like it was raised in the Blanco area as well, which makes sense why they would have a relationship with the Jaquez/Archuleta family that came from the Blanco area. Easy, right? Okay, it wasn’t an easy path but we’ve made it. So, looking at this resource, we are missing at least two generations of descendants because if you look at just the page from my family the only grandchild listed is Tara Lynn O’Shea but in actuality (now) that is 16 additional people (all of my dad’s descendants). I think if this book were written today it would be close to 4,000 to 5,000 people. Now we know our connection to Leroy Jaquez. Of course, our bigger connection is Maria Rosa Villalpando and Juan Joseph Jaquez. Two people over two hundred years ago started a life together that perhaps didn’t end the way they thought it would, but look what they created. They started a hell of a family. Next up? I had a very nice email from a young lady by the name of Lisa Barrett who says she is a descendant of Maria Rosa Villalpando. Of course she is. I went to a funeral a couple of weeks ago for an aunt of mine. Now, I know people who are jumping up to say, “Well, she wasn’t really your aunt.” We know. But she was. Aunt Flora was such a kind hearted woman and I saw her a lot. Yes, she and dad were actually first cousins. In fact, they were double first cousins. They were raised to treat each other as family. So, I took my girls, Taylor and Hailey, and together with my sister Jackie we went to the rosary. If my dad were here, he would’ve gone, so we went. It was a pattern. Whenever you would ask my dad how someone was related, he would explain it if he could but if not, he’d just say, “They just are.” Yes, the same answer I give my children. So, without further ado, let’s figure it out. First, I went on Facebook and friend-ed a woman by the name of Janie Jacques. I had seen her name a bit on Facebook but wasn’t sure who she was. Then, I asked her how she was related. She said that her husband was Leroy Jacques and that his parents were Sam and Vera Jacques. That still didn’t ring any bells for me but I thanked her and said I would have to look into it. She also said Sam Jacques’ parents were Leonardo and Pablita Jacques. I was thinking that this new information would make sense to me but it did not. However, the name Leonardo sounded like it was a name I had seen before, but I really couldn’t have pinpointed where. Next, I went to my Ancestry.com account. Someone said to me that we have more access to information than we ever have had in the past because of the internet and she was right. The medium has allowed us to instantly access thousands of records that our parents never could have dreamed of, right at our fingertips. I know my cousin Tommy had elaborate charts of people but sometimes it is easier to do the research yourself because then you can digest the information and really make a connection to whom you are researching. First I started searching for a Leonardo Jacques. I found a couple of leads for a Leonardo born in 1884 in Colorado. There was a lot of jumping back and forth between New Mexico and Colorado by Jacques and Archuleta families back in the day so I figured I was headed in the right direction. Then I combined the name Leonardo with his birth date and came up with a Jose Ynes (Inez) Jacques (born in 1838), as his father, and a Maria de Los Angeles Roybal as his mother. That still didn’t mean anything to me, but I thought I had seen the name at one point. Now, when I asked Janie Jacques if Leonardo was a brother to Juan N. (my thought) she said she didn’t know but thought there was an Alfred, Rosita, Anastasia, Georganio and a Franciquitos. Now that was interesting. I found a 1910 Census listing for Leonardo Jaquez in Blanco, NM. He is married to Paulita Jaquez and his son is named Jose V. Jaquez. Leonardo is 26 years old, which would put his date of birth at about 1884. That seems about right. Just looking at my tree, I do find a Leonardo who seems to be born in 1884 to Jose Eusequio Jaquez and Antonia De La Luz Ortega. Perhaps we are on the right track? Not positive. However, what was throwing me off were the names she gave me: Alfred, Rosita, Anastasia, Georganio, and Franciquitos. My tree shows siblings for a Leonardo that include Alfredo, Remigio, Margarita, Enrique, Antonia, Patricio, Jose, Maria Francisca, Brigido, Entero, and Pedro. Well, that doesn’t match up exactly but sounds close. So then I started searching again, and this time I found a Gorgonio Jaquez. Now, I thought that seemed very close to what Janie had given me. 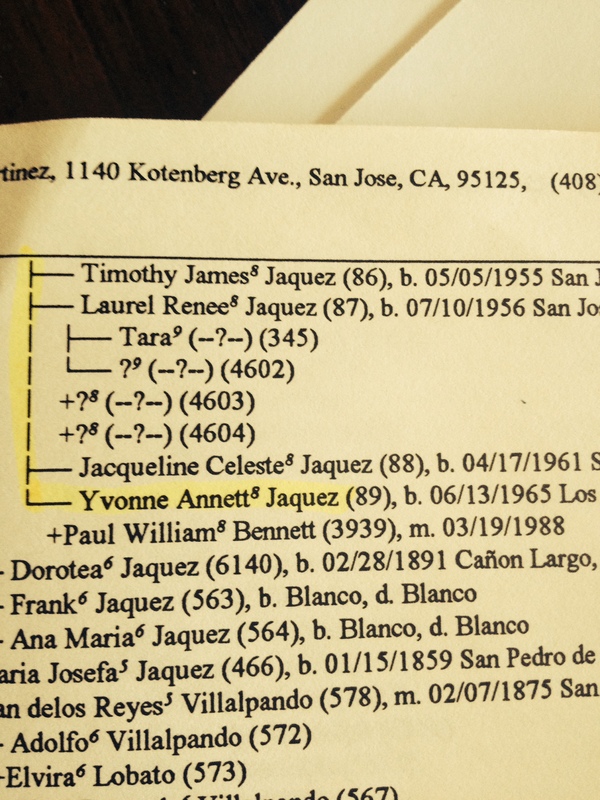 This time, I found his parents were Jose Inez Jaquez and Maria de Los Angeles Ruybal. 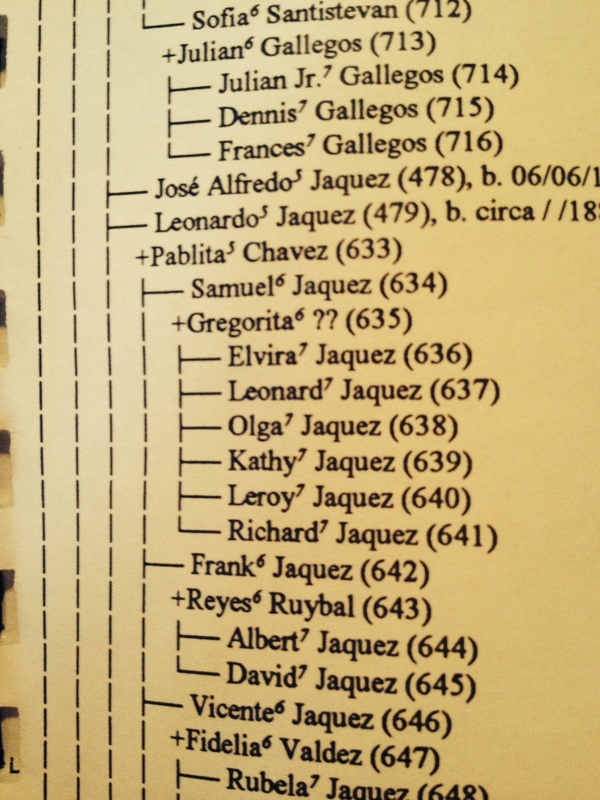 This list of siblings for Gorgonio Jaquez included Concepcion, Manuel, Juan Pablo, Clara, Anastacita, Carlota, Leonardo, and Lucia. That Leonardo was born in 1905. So this might be the right line. Jose Inez Jaquez is the child of Felipe de Jesus Jaquez and Maria Manuela Bustos. Head hurting yet? Mine is. This weekend, I will pull out my information from Tommy Martinez and see if I can’t get us a better answer. It does seem likely that Jose Inez Jaquez and Maria Roybal were probably the parents and Jose Inez a son of Felipe de Jesus Jaquez. Also at this funeral, I spoke to the gentleman in the pew behind me. He said that their father was a friend of Pete Lujan and that he had worked in the mines with him. 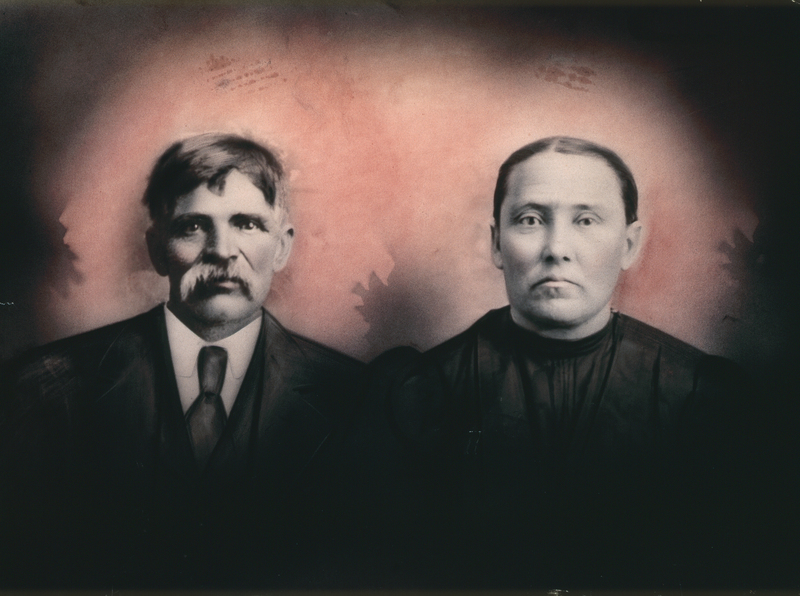 They lived in Durango, Colorado and that their father’s name was Salomon Quintana. This gentleman, too, asked if we were related to Sam Jaquez. Wow, really? Crazy family!